Twenty people allegedly linked to the 11-day-old battle around a Palestinian refugee camp in northern Lebanon have been charged with terrorism. They are accused of being members of Fatah al-Islam, a group the government blames for starting the worst internal fighting in years. The accused - mostly Lebanese and one Syrian - are charged with the deaths of a number of soldiers and civilians. There was fierce fighting around the camp overnight which later cooled off. 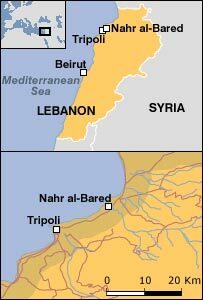 The Lebanese army and the Islamist militants entrenched in the Nahr al-Bared camp exchanged artillery shells and mortar bombs. The official Lebanese news agency said there were a number of direct artillery hits on the militants. 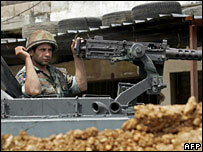 A military magistrate filed the charges against the 20 suspects accused of attacking Lebanese troops. The accused are alleged to have "formed armed groups to attack civilians, the authority of the state and its civil and military institutions, and to have carried out terrorist actions which killed or injured military personnel and civilians," officials said. If convicted, the suspects could face the death sentence. Dozens have died since the beginning of the siege, including civilians. The UN estimates that about 25,000 people have now fled the camp. But Nahr al-Bared houses around 31,000 people and some people remain trapped inside. During periods of calm, International Committee for the Red Cross convoys have entered the camp to deliver much-needed drinking water, food and medicine. The fighting at the camp is the bloodiest internal conflict in Lebanon since the civil war ended 17 years ago.